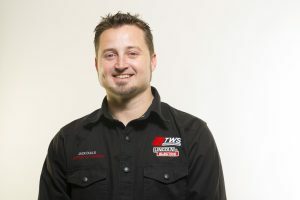 Jack is Director of Training at the Tulsa Welding School, Jacksonville campus; he is responsible for all aspects of the welding programs at the campus. Jack has been at TWS for 13 years. He is also a graduate. Thanks for speaking with us, Jack. Tell us when you graduated. I was part of the very first class to come through the Jacksonville campus in 2001. I was 20 years old, and I worked hard. I wasn’t the best welder in my class, but I had a job within three weeks of graduating. It was a pipe welding job, so I traveled all over the Southeast, working in power plants, juice plants, poultry plants…a lot of plants! So how did you end up teaching at TWS? It was 2005. Some people I knew asked if I’d be interested in becoming a nighttime instructor. It piqued my interest, so I came over and worked two jobs. I discovered I really enjoyed working with students, so when they asked me, I went full-time a few months later. I went on to become the nighttime lead. A couple years later, I moved to daytime and became the daytime lead after about a year. I’ve been the Director of Training for the past seven years. How was switching from the field to teaching at welding school? I did okay for myself in those five years in the field. I made a pretty good chunk of money and was sensible, so I was in a situation where I didn’t have to run the roads like I did. To be honest, I got tired of sleeping in hotels. I was tired of that lifestyle. So I was happy to find a situation that was stable and in town. I was able to buy a house and get married, and now I have kids, so that’s changed everything again! So what is your main responsibility as Director of Training? I’m ultimately responsible for all the welding education at the Jacksonville campus: the curriculum, the training and the instructors. I make sure the students get what they’ve paid for and what they’ve signed up for. I hold the instructors accountable, making sure they are doing what they are supposed to be doing. Do you make changes to your curriculum? If there are revisions that the Advisory Board would like to see implemented, then that’s what we do. We also have employers ask us to make adjustments. Some employers wanted us to start teaching students how to run MIG and Flux Core on pipe because that’s where the industry was going. So I changed my program around in that phase so we could meet the demands of the industry, and it’s been a huge success. We get a lot of graduates who get jobs doing that very thing. We’ve even changed our teaching styles a little to suit the younger students coming in these days. We have moved to an online platform. What’s your direct involvement with students these days? Unfortunately, I don’t get to teach anymore. I kind of miss that. But I do get to counsel, mentor and advise them. I’m able to connect with a lot of the younger students because I can share my own experiences. I can tell them that I’ve traveled the same path, gone through the same trials and tribulations. I also work with students who are falling behind; sometimes I have to give them tough love, and sometimes I just weld with them. Whatever their situation is, I try to help them get back in the right direction. What’s the most common question you get asked by students who are struggling? It varies. Early on, some struggle just starting the rod. It can be very frustrating because when they go to strike it, the rod sticks to the plate. It can be very aggravating. But I share my experience and tell them I struggled like crazy, too. Then I show them techniques that helped me—how I set up my body position and such, practicing with the power off—and then they start to get the hang of it. In the later phases, I hear students say “I can’t do this,” “I’m stuck at 6010,” “I’m struggling trying to get my projects to bend,” but again, that’s when I share my own experiences. I tell them I took nine tries with my 6010; I failed eight times in a row and was just as discouraged. I even remember saying, “I don’t know if I can do this.” But I stayed with it, kept working, and the ninth time I passed, and I didn’t fail one after that. We just encourage them to keep stepping up to the plate to make it work. We offer one-on-one tutoring in the afternoons to help them get back on track. So how many welding instructors do you have in Jacksonville? I have 25 instructors right now and a total of 30 employees across all three shifts. To be an instructor at Tulsa Welding School, you need a minimum of five years experience. I’d say that we have around 350 years of welding experience on the shop floor every single day, varying from shipyard experience, to aerospace, to nuclear power plant construction work. That’s the beauty of our instructors: We have the whole gamut of experience here. Maybe one of my guys doesn’t know about “this,” but he can go over and talk to another guy who can tell you all you need to know. The team has vast knowledge. Communication. If they communicate with me, I’ll do everything I can to help them. Most of the students know that about me. I introduce myself at orientation, and they always see me around; my office is down on the shop floor, so they can’t miss me, really. I do my best to help them with whatever. I’m here for them at all times. What advice do you have for students who may be considering attending TWS? If they get to a point where feel they are struggling, ask for help. Ask questions and take full advantage of the school: Stay and practice. The school is open 15 hours a day. It costs students zero extra dollars to stay and practice at our facility. The biggest thing is just being here and working with the guys. This school changed my life as a graduate. I say that in every orientation I do. It can do the same for every person who comes to this school and takes advantage of this opportunity. If you come here and think you can just walk through it, sitting outside smoking cigarettes, you came to the wrong program. If you come here, work hard and do what you’re supposed to do, you will change your life, have the chance to be successful and put a lot of money in your pocket.